Ray of Hope For Press Club Patiala. 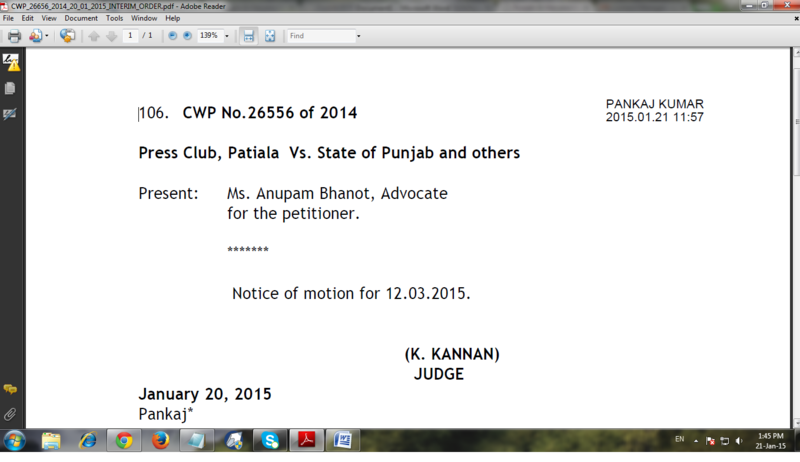 Punjab and Haryana High Court Issued Notice of Motion to State Bank Of Patiala. Hon’ble Justice K. Kanan issued notice to State Bank Of Patiala YPS Branch Patiala, Deputy Commissioner Patiala, Additional deputy commissioner Development Patiala And State of Punjab Through Principal Secretary Punjab for 12.3.2015 . 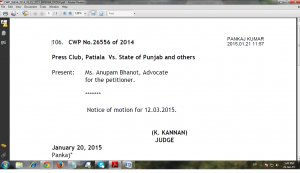 The counsel of Press Club Patiala Ms. Anupam Bhanot said that a Grant Of Rs. 50 Lakh for the development work of Press Club Patiala was announced by then Chief Minister of Punjab Captain Amrinder Singh and first installment of Rs. 25 lakh was received in the bank account of Press Club Patiala But administration interrupt to the development work of Press Club Patiala unnecessarily and the Bank has transferred money without the consent of the President/Sec./governing body of Press Club Patiala .